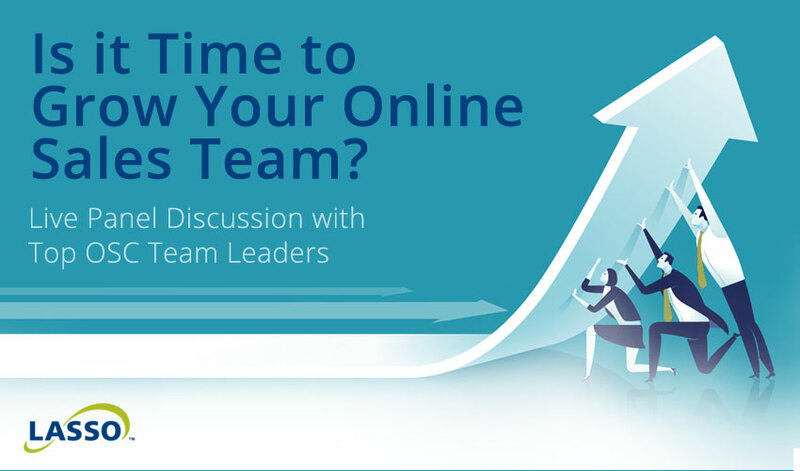 Webinar | Is It Time to Grow Your Online Sales Team? On Tuesday, July 11th, Lasso’s Sara Williams hosts a live panel discussion on growing your online sales team. She’ll talk with three of the new home industry’s top Online Sales Counselor team leaders – Anna Hoffpauir with CBH Homes, Cori Masters with Royal Oaks Homes, and Doug Whitford with M/I Homes. They’ll discuss when it’s time to expand, how to go about it, and overcoming challenges along the way. Online sales are now an integral part of the new home sales industry. Online Sales Counselors (OSCs) juggle hundreds of leads per month and can contribute up to a third of total sales volume. Additionally, builders with OSCs respond to online leads 35% more often and 25% faster than their non-OSC counterparts. As more prospective home buyers turn to the internet as their primary research tool, builders and developers must keep up with demand while managing the workload of the online salesperson. This panel discussion will answer often-asked questions about taking your online sales program to the next level. Join us! Register here for the recorded webinar. If you haven’t yet launched your online sales program – download the Lasso guide, No Lead Left Behind. I think that it’s great that you are addressing this shift to the digital realm. It’s amazing that to be successful in this day and age, you need an intangible digital presence behind your tangible goods and services! Thanks, Ryan! Yes, a strong digital presence in new home sales cannot be ignored or downplayed!